Just days away from the start of the Eastern Pacific Hurricane Season on May 15th, there’s already a tropical system developing in the Pacific Ocean. The Central Pacific Hurricane Season and Atlantic Hurricane Season start June 1. The 2018 hurricane season is forecast to be an active one. 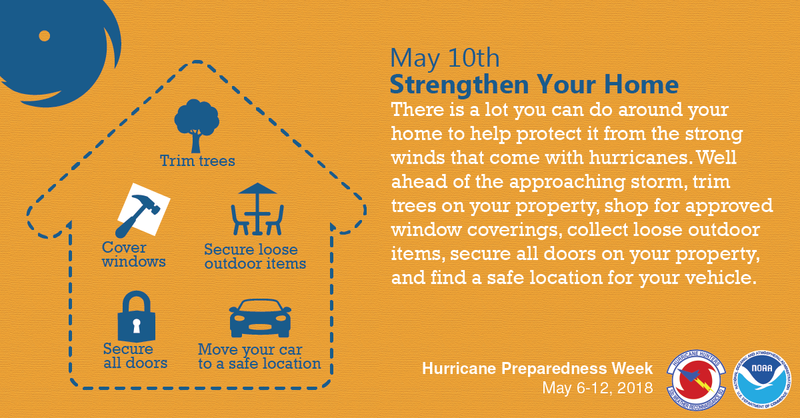 Each day from May 6 -12th, the National Weather Service provides tips with YouTube video links on getting your family, neighbors, home and property hurricane ready. 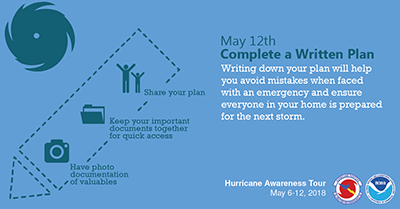 The daily topics cover the hurricane hazards, developing an evacuation plan, disaster supplies to have, an insurance policy check and applying for flood insurance before a hurricane strikes, making your home stronger against flooding, how to help your neighbor and making a written plan. 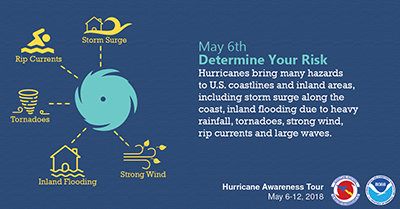 The Hurricane Preparedness Week website also has current forecast information on tropical storms and hurricanes developing in the Pacific and Atlantic oceans and hurricane hunter plane tours at inland airports from the Gulf Coast this week. The hurricane tours are open to the public. Earlier this week, the hurricane tours were in McAllen, Texas (Monday), Beaumont, Texas (Tuesday) and Baton Rouge, Louisiana Metro Airport (Wednesday). Today’s Hurricane Tour is at Montgomery, Alabama Regional Airport and at Lakeland, Florida Lindler Airport on Friday, May 11th. 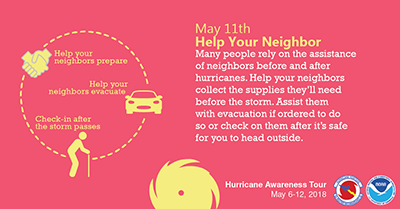 This entry was posted in Hurricane Preparation, Hurricane Season, Things to Do, Weather and tagged Hurricane Preparedness Week 2018. Bookmark the permalink. After Jesus dies on the cross, it is night time. Joseph, a wealthy man and a disciple of Jesus asks Pilate for the body. Pilate releases Jesus’ body to Joseph, who wraps it in clean linen. Joseph places the body in his new tomb and rolls a large stone against the tomb’s door. The next day, the chief priests and Pharisees meet with Pilate. Afraid Jesus will come back to life in 3 days, they ask Pilate to order sealing the tomb to prevent Jesus’ disciples from stealing the body and telling everyone Jesus came back to life. Pilate tells the chief priests and Pharisees to use the Temple guards. They go to seal the tomb securely and post guards to keep out intruders. Early Sunday morning, Mary Magdalene and the other Mary visit the tomb. There is a great earthquake. An angel of the Lord from heaven rolls back the stone from the tomb’s door and sits on the stone. The angel’s face is like lightning and his clothing is white as snow. The guards afraid become like dead men. With great joy, the women run to tell Jesus’ disciples of Jesus’ resurrection. The tomb guards also tell the elders and chief priests what happened. The chief priests and elders bribe the guards to tell the Jewish people that while the guards slept, Jesus’ disciples came at night and stole the body. Jesus’ eleven disciples go to Galilee and see Jesus, but some doubt it is Jesus, resurrected. Jesus assures them.